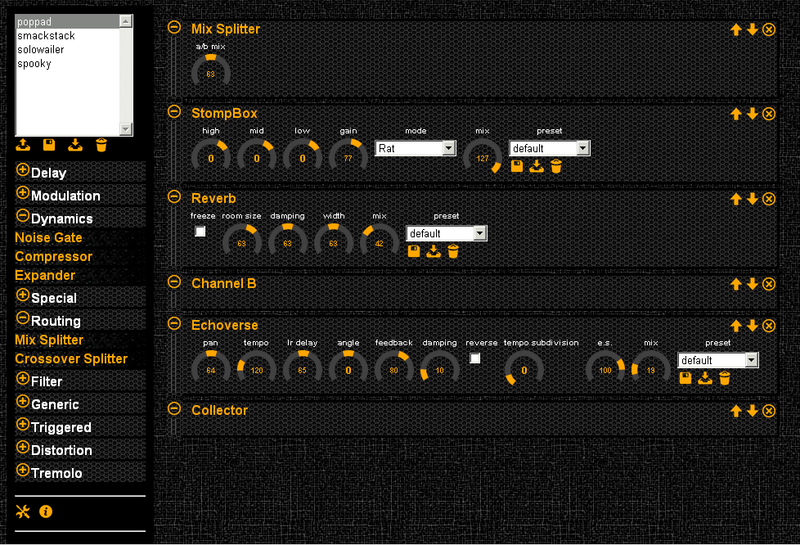 Racka3, pronounced 'rack-a-rack-a-rack', is a guitar effects software. It works on Windows and Linux and has a large number of effects which can be stacked and routed in many interesting and useful ways. You plug your guitar or microphone into your computer, plug in headphones or speakers, and Racka3 processes the sound input in as you play. There are two seperate repos, one for Linux and one for Windows. The Linux build needs only needs ALSA, so will work on any modern Linux. Internally it uses PortAudio but this is bundled, so the only external is ALSA. I dont have a ready-to-go package, but its easy to build. Really, the aim of the project on Linux is to be a good base for embedded projects. To use Racka3 on windows you need a soundcard that has ASIO drivers. This soundcard will work well. If you do not have ASIO drivers for your soundcard, you will suffer more latency, but can get a generic ASIO driver shim. Once you have this installed, you can install Racka3.